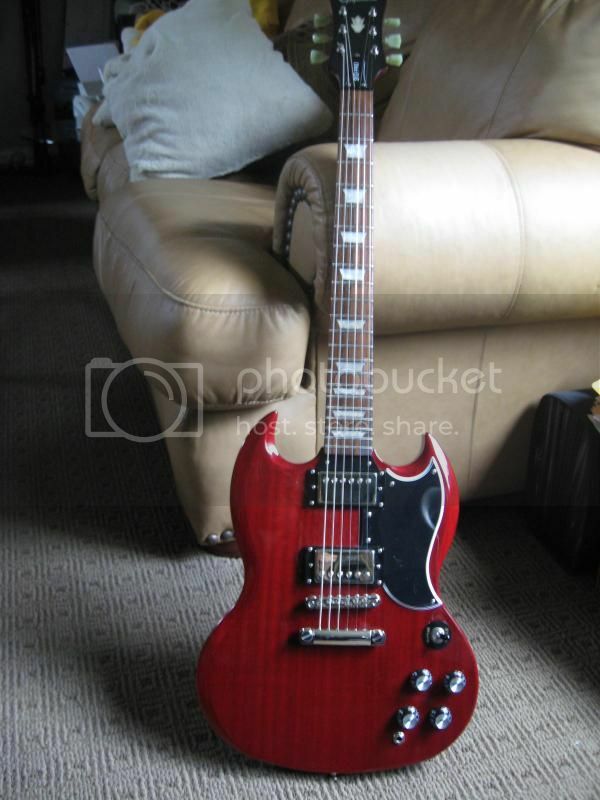 tell me about Gisbon Standard SG how does it compare to an epiphone sg special? Discussion in 'Guitars in General' started by gishlullmoon, Apr 14, 2016.
tell me about Gibson Standard SG how does it compare to an epiphone sg special? i have an epihpone special sg and it is good. i like the sound out of it but i still need more power,bassy chunky tone from it. thats really all i wanna know is just how much more chunkier it would be with the standard sg.....? is it really worth to pay $1,200 for the standard? is buying a standard sg worth the cash?? my cousin (i haven't tlaked to in years it has been a while) says he got the blue one.....but i wasn't interested in the sg at the time so i didn't take notes. I bought my epihpone sg later down the road after i saw him. 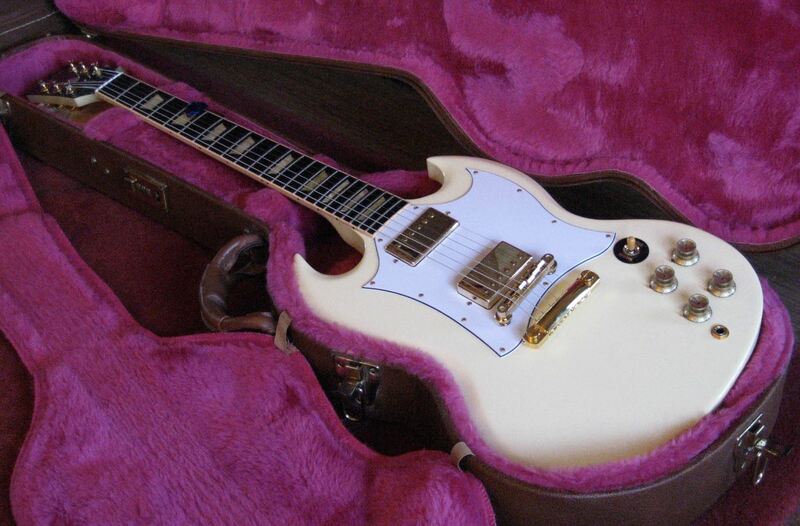 A Gibson SG Standard is to an Epi Special as a Porsche 911 gt is to a 72 VW beetle. Both get you there, but one looks (and plays and and sounds) so much better doing it. Play some other Gibson SGs. The Classics, Js, Specials and Tributes and others are great guitars also. sg~guy and JPIndustrie like this. not even close. the Epi is a good guitar for beginners or even as a backup (with a couple of mods) but the SG Standard is miles ahead of it in terms of quality. I've no idea on the current Epiphones but in the mid 90's I had an Epiphone SG400 made in Korea that was a gem, it was every bit as good as a Gibson, I should of held onto it. Isn't the Epi SG Special a bolt-on guitar? You get what you pay for...? You're a supporting member right? had to look it up but yes. well with this in mind i can't even believe that the OP has to ask if a Gibby SG Standard is better. the g-400 series epiphones aren't bad at all but the bolt on ones are cheap and not all that great. The epi sg special i know of was a set neck limited edition. If thats the one, it's not likely to sound very much like a mahogany gibson sg because the ones i have seen are mahogany or sapele (a mahogany look alike) veneer with the body made of what looks to be agathis or some similar tight grained budget wood that won't sound much like a gib sg. So the gibson will sound much chunkier. Even more so if u r talking about a set neck epi. -try them for yourself, bring your guitar with you for a true A-B TEST,..
epi g400 has muddier pickups & a thicker body & also does a good neck dive if it's equipped with grovers . My Gibson SG Standard does this to be fair. Not sure if that's just how SGs are, or if it needs a proper setup, or if I just got a bad one? It's much harder to play than my LP and even my cheap parts strat, notes just die out quicker and sound weaker. Chiming in: my advice stands: find the guitar you want and can't put down. Then buy that and play it all the time. It doesn't pay to get a guitar you pay a lot of money for and you decide you really don't like it in the end. You need to get the guitar you want to pick up and play all of the time. this is what was going on in the back of my head....... i want to buy is a PRS custom 24 (actually Tim Mahoney Private Stock model if they still make them) but i still think the sg would have that chunk tone....? plus i don't know if i'll ever have that much money it would take me a couple of years to get the PRS. i still think i should buy a standard sg because lot of my heroes used em but i don't really like playing my epiphone much compared to my PRS SE ....so i hope the sg standard is VERY different....... guess i'll go to guitar center and try the best sg model they got and see whats what. thanks for everyones input i still wanna get the standard sometime later this year. I think that is your best bet. The SG Standard is way ahead of any of the Epiphone stuff in terms of feel, tone, playability, fretwork, etc. But again, it's only a few notches ahead of the Special Faded model, which is far more affordable (and that seems like it's what you're looking for). I own two Gibson SGs. They are my only guitars that were more than a couple hundred bucks. If the Epiphone models were even comparable, I would've gotten one instead. would a private stock custom 24 you guys think be chunkier than the standard sg?? i have a prs tim m. and it is great more saturated sound than the epiphone sg i have, which is great but the chunk isn' t as good as the ep sg. do you the the priv stock custom 24 tim mahoney would be chunky??? itd be chunky like a gibson too right????? since its a combo of gibson + fender? or should i just cough up cash and buy sg??? the guitar i really want is tim mahoney's usa model prs. but so many people use sg's......i jam to my stereo with my ep sg. so this is why i'm debating..... i've never played real prs or sg so this is why im asking these questions. I beg to differ with some of the statements that Gibsons are "way ahead" of Epiphones. Of course every guitar is different, but I had a 2013 '61RI that was a very nice guitar. Good workmanship, playability, nice wood, and hardware. It sounded good, too. Then, on a lark, I picked up a Epi G-400 Pro. Workmanship- flawless, hardware-solid, playability- equal or better than the Gibson, price $269. The Gibson is gone, I love playing the G-400. It's brighter sounding than the Gibby, but rolling off the tone control gets you there. With the brighter pickups and coil split option, it's a much more versatile guitar than the '61. If you can get past the poly finish(which I don't mind- it stays looking new) I can't see a reason to pay the extra $$ unless the headstock name is important to you. At the the time I bought my Gibson, the reason was that the Standard's neck profile with the binding was more familiar and comfortable to me than the G400's neck. In the years since I've become accustomed to more variation in neck shape and a G400 might be fine for me now but it would be redundant to guitars I already have. Forget Epiphone G400 guitars, those are cheap and good for newbies. A Gibson SG Special or Standard will give you more GOOD VIBRATIONS . I'm no noob, my G400 is a lot of guitar, and sounds and plays amazing. I'm seasoned enough to be over the snobbery of what it says on the headstock, or where it was made. If its a good guitar, I'll play it.